Sam Kekovich was a star Australian footballer with North Melbourne and Collingwood football clubs. He was instrumental in North Melbourne’s first premiership in 1975. His career of 150 games spanned over a decade and included a club best and fairest in his second year and selection in State of Origin competition. He was always colourful and an easy topic for the media to talk about. Kekovich now spends his time as a commentator and entertainer. His media resume includes appearances on The Footy Show, co-hosting the 3AK radio Melbourne breakfast show and Pardon the Interuption Australia on ESPN. He has been a presenter on radio SEN 1116 and Triple M’s pre-match show. 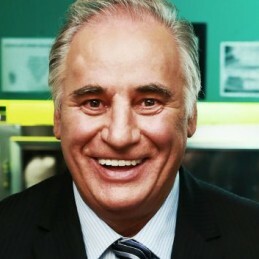 Kekovich also served as the CEO of K Rock radio in Geelong. Kekovich is perhaps most famous as the face of Meat and Livestock Australia to promote lamb. This hugely successful campaign spanning many years has seen him give the Australian public a sometimes controversial mouthful of truth followed by his ever present catch-cry ‘You know it makes sense, I’m Sam Kekovich’. Engaging, entertaining and incredibly humorous, Kekovich is a fantastic story teller and host who draws on his last 30 years of life on and off the sporting field.